George Osborne Tries To Sit In First Class With Standard Ticket, Gets Caught, Pays £160 Upgrade. Just like I said on the GREAT MONEY TRAIN HIJACK!!!!!! 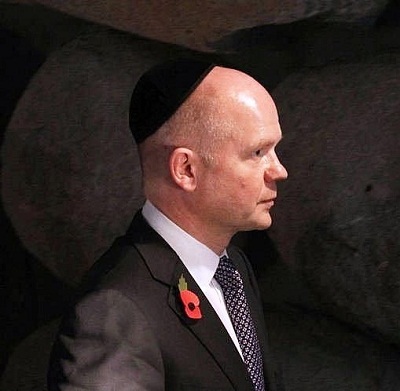 As if the so-called Nobel ‘Peace’ Prize being awarded to the European Union was not enough, I was further stunned by this grotesque and revealing image of Herr Hague. In fact it was the reorganisation between the three Germanic power blocs; America Germany and the English that established the post war order and what passes for peace. World Wars I and II were Germanic wars and nothing else. The peace established after the war is a PAX GERMANICA. Does anyone seriously believe there could have been a world war with Spain, Italy, Russia and Japan ???!!! I’ll say it again: THE ‘WORLD’ WARS WERE GERMAN WARS. The savagery and brutality carried out by every kind of German from Auschwitz to Hiroshima, revealed the true nature of all Germans to the world. Bizarre costumed antics like the one above cannot hide the true nature of Germans and their societies from the world. The sight of a yarmulke on top of a set of features so clearly typical of the Germanic body and mind is one of the most offensive and disgusting things I have ever seen in my life! Check out the Five Eyes on the internet. AUSCANNZUKUS or the SAXON AXIS.